Finally. FIFA has grown some balls and taken action against the Indonesian football association, PSSI, and banned them from competing in any FIFA sanctioned competition. In the short term that means Persipura can say good by to any hopes they may have harboured of winning the AFC Cup while the national team can forget about finishing fourth in their World Cup Qualifying group that is due to kick off next month. For years it seems FIFA has treated the PSSI with kid gloves, a naughty but at heart good natured school boy whose indiscretions were tolerated if not encouraged. But what indiscretions. The straw that broke the camel's back? A little known government body called BOPI deciding two clubs, Arema and Persebaya could not play in the 2015 Indonesia Super League citing ownership issues that date back to the duelism period that only ended last season. BOPI, who had never taken any interest in football previously suddenly announced their own criteria for the league despite the fact Arema and Perserbaya had already passed PSSI and AFC benchmarks. BOPI fall under the remit of the Youth and Sports Ministry and they supported this body who had supposedly not seen any problems with Arema and Persebaya in 2014 but then it is amazing what a change in government can do isn't it. The ISL season stopped after two rounds, ostensibly so the PSSI could carry out their elections in Surabaya. That process was not without controversy when some thugs linked with a group linked with the eventual winning candidate invaded a TV studio while football was being discussed and slapped one of the participants...a participant who disagreed with their man. Following the election the ISL tried to restart but the government refused to allow security clearance to be released and ceased to recognise the PSSI, announcing the game would be overseen by government bodies. The league responded by cancelling itself by declaring force majeure. FIFA started taking notice and announced if the two sides could not reconcile by 29 May then sanctions awaited. The governing body takes a very dim view of what it deems to be political interference though given the events in Indonesian football over recent years the imposition of sanctions does seem to be selective. At the same time Indonesian politicians take a dim view of being pushed around by foreigners. Quick to beat the nationalist drum the government stuck to its guns insisting the move to not recognise the PSSI was part of a bid to clean up the game and they created a transition team featuring celebrities, politicians, military types and other well connected people to chart a path for the game's future. Finally, FIFA acted where it should have acted years ago when Nurdin Halid was first sent to jail. Their apathy has brought us to this point and football here has taken advantage. The idea that the government can build a professional football set up is laughable. The previous lot were instrumental in the setting up of the IPL, a short lived rebel league that ended in tears and unpaid wages - on other words the same as the PSSI. Nothing will change all the while the same old faces are involved and the types of people involved are longer attracted to the game. Club owners are often people with political ambitions, be they local or national, who see football as a way to big themselves up while having access to potential vote banks and cash. They have little knowledge of the game and are not in the game for the game. They are in it for themselves and any hope they can improve the game is just wishful thinking. It ain't gonna happen. Clubs are not really clubs in the traditional sense of the world. They are teams cobbled together on a season by season basis by people with little administrative experience and less marketing savvy. This whole mindset needs to change, we were promised it would during the heady days of #ChangeTheGame and the IPL but of course we know how that ended. New faces at the trough. The PSSI is not blameless. They are consistently accused of negligence, of overseeing match fixing, of taking little interest in the development of the game at grass roots. Instead they blame a referee mafia as if the man in the middle is at the heart of the game's problems. They continue to overlook the main issues that blight the sport at the expense of their own show boating and the result is football continues to regress. Bambang Pamungkas, that articulate former national team captain, once said players of his generation, the likes of Budi Sudarsono and Ponaryo Astaman, were the failed generation. They were failed...by the PSSI. It is difficult to see what the end game is going to be now after the FIFA suspension. The government will be in no hurry to back down, not after the political capital expended by the sports minister and if anything the rhetoric is likely to increase as they play the tired nationalist card. Eventually no doubt some compromise will be cobbled together but it won't really change anything because no one really wants to change anything. The same people will be involved, the names may change but not their agendas. If the government really wanted to do something about football they would do what the FBI are doing with FIFA...follow the money but that won't happen. Football's malaise is here for a bit longer I am afraid. Disappointing for Persib to go out but perhaps their result against Kitchee and the fact that JDT thrashed a Myanmar side while the Maung Bandung struggled for a 3-3 draw tells us where the best Indonesian club sides are on the international stage. There is a greater savviness, more openness at clubs in Malaysia, Hong Kong etc that allows them to take on board new ideas and try to build football clubs. All the while Indonesian clubs continue their day by day, hand to mouth existance without much in the way of leadership or vision. Would Ilija Spasojevic have made much of a difference had he played against Kitchee? Who knows but when it comes to tactical nous I think Kitchee have the upper hand anyway and the players to nullify threats. Pahang or Persipura fate still to be decided. I was excited about my first game in the United Arab Emirates. An excitement had you asked me 10 years ago I would not have recognised. But things have changed and here I was in Dubai and alighting at Oud Metha station on my way to the Al Maktoum Stadium. Hosts Al Nasr were taking on Arabian Gulf Champions Al Ain in the President's Cup, an important trophy that was for some reason being played post season. There were a couple of other games on in town on the same evening, my gut feeling suggested catching Al Ahli take on Dubai in another part of town but I couldn't pass the opportunity to catch Omar Abdulrahman in the flesh. I never saw George Best in his heyday, I had at least to catch this lad. The walk from the metro station was an eye opener. I was going against a flow of the religious who had just finished attending a service at a catholic church while a right turn saw me battle my way through members of the India Club parking their cars. There were already a few Al Ain fans milling around the stadium as I went to buy my ticket. 50 dhirams, about a tenner for a seat in the main stand. I tried to pop in the club shop but wasn't allowed...could only order through the open window and ended up buying a scarf which I will probably never wear! More bad news...as I entered the stadium I was told by the security officials my Nikon D40 was considered a professional camera and could I please leave it in my car! Car? Anyway that explains the grainy images courtesy of my tab. By the time the game kicked off the crowd inside was perhaps a couple of thousand but they were making a bit of a din with the travelling support making themselves heard. To be fair the game was no classic. Al Ain were coming off the back of a long season and were in the midst of an AFC Champions League tie with another UAE side Al Ahli. Still, they fielded most of their big names including the mighty Omar but despite some delightful moments of skill from the 23 year old it was the hosts who won the game, Toure netting from a tight angle right at the death. It was perhaps poetic justice for the striker had taken some flack from the home support having missed a couple of opportunities early on so he savoured the applause. One thing about the Arabian Gulf League...there is plenty of information out there about it. There is a professional looking website and some of the clubs have English language websites. There is also excellent coverage from a couple of local newspapers including The National. Unfortunately the season is all but over, not just in the UAE but throughout the region; it gets bloody hot doncha know so I guess the next games I catch will be in August when the seasons start but I am already looking forward to catching the odd game in the UAE. Anyways, Dubai and Abu Dhabi both offer football and beer...what more can a man want? Kuwait is to host the 2016 Gulf Cup of Nations. The tournament will start 23 December and run through to 7 January and the draw will be made 25 September. Mitra Kukar defender Dedi Gusmawan is looking to play in Myanmar. Gusmawan has already been to the country for trials with Zeyar Shwe Myay and their coach Stefan Hansson is hopeful a deal can go ahead. Hansson of course will be familiar with the 29 year old defender having coach Mitra Kukar for a couple of seasons. Having previously played for PSDS and PSPS, Gusmawan joins a small club of Indonesian players plying their trade overseas. It would be nice though if a few more tried their hand; we keep hearing about their potential, surely there is no way of proving that potential than by getting out of the comfort zone that Indonesia is. Once upon a time there was Persisam Samarinda Putra. A team from East Kalimantan in a city that has more decent stadiums than the whole of Jakarta. Known for a large fan base, Persisam attracted much larger crowds than nearby Persiba and Mitra Kukar. Then politics stuck its ugly nose in. Persisam were taken over by someone who the fans weren't too keen on. The fans formed their own team, Pusamania Borneo while the new owner of Persisam rebranded his team Pusam. Last season saw Pusam play in a cavernous stadium in front of a tiny number of fans (pictured) in the ISL. Pusamania competed in Divisi Utama hving bought the license of Perseba Super Bangkalan. Pusam struggled all season while Pusamania earned promotion from Divisi Utama and football fans in Samarinda were looking forward to the possibility of a Samarinda derby in the ISL this year. However, having lost the battle for the hearts and minds of the supporters, Pusam scouted around for a new home before deciding on Bali where they rebranded themselves Bali United Pusam. It seems the two sides have now made up because they are due to meet in a friendly match later this week at the Segiri Stadium in Samarinda. Politics is often never more than a game of power people top trumps and that seems to be playing out in the wild and wacky world of Indonesian football. Just hours after Pahang players turned back from Jayapura and returned home to Malaysia following the refusal of immigration to let their players in the country the vice president met with the PSSI and the sports minister. For those with short memories the sports minister refused to recognise the PSSI a few months back after some outfit called BOPI deemed two teams in the ISL, Arema and Persebaya, did not fulfil their requirements. Attempts by the PSSI to restart the league or to start a new pre season competition floundered as BOPI refused to approve the games. A meeting earlier today saw vice president Jusuf Kalla meet with the sports minister and the PSSI. The result? Jusuf Kalla overturned the sports minister decision re the PSSI meaning, I guess, the PSSI are once again the only show in the town. It also leaves the sports minister in a funny position, and I don't mean outside right, after expanding so much energy in his bid to reform football (insert emoticons where necessary). FIFA are due to meet to discuss Indonesia soon after a deadline of 29 May has passed. Whether Kalla's actions have succeeded in halting any serious punishment from the world body remains to be seen. So for now we are left with the PSSI, previously upset at government interference in the game, falling back on government interference to halt an imasse caused by government interference. This was the season Hougang United were supposed to kick on. They have certainly improved since the days when they were known as Sengkang Punggol but ahead of the current season they merged with Woodlands Wellington with fans perhaps believing the greater resources would benefit the club. Ain't happened though and after 10 games they had drawn four and lost six, sharing bottom spot with Young Lions. All that grief was forgotten last night after picked up their first thre epoints of the season against Geylang International at Hougang Stadium. Francisco Ela's goal with 17 minutes remaining was enough for Salim Moin's men and after the game the relieved coach said 'I always have a belief in my players and today my players did really awesome. They worked really hard and they deserved the points'. Is it enough to turn the season around? Hougang's next game is against Global (Philippines) in the Singapore Cup but you get the impression the Cheetahs would prefer to build a run of good results in the league after their torrid start. 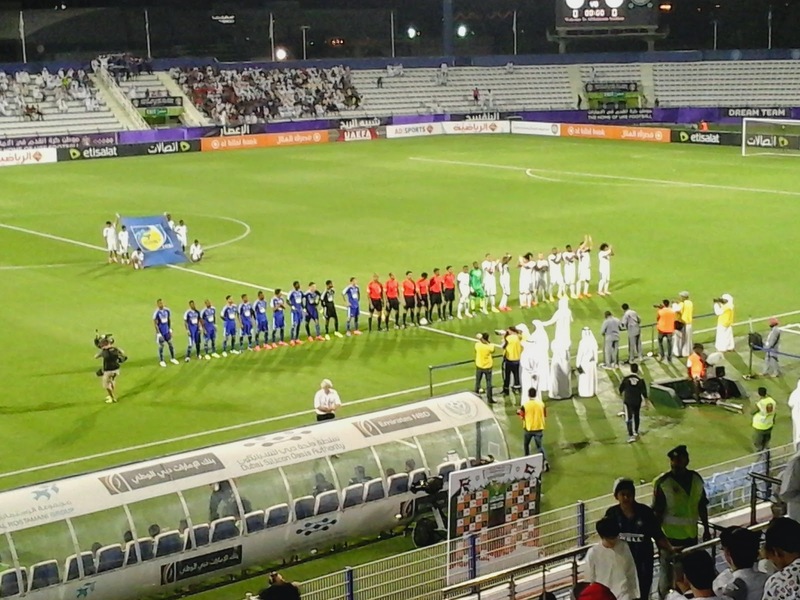 Kuwait missed out on reaching the AFC Under 23 Championships after being held 3-3 by Jordan in the final group stage game played in Al Ain, UAE. After a goalless first half Jordan took the lead through Baha' Faisal on 58 minutes, the first goal the Kuwaitis had conceded in the competition. Kuwait hit back almost immediately with a five minute brace from striker Faisal Alazemi to go with the pair he had netted against Pakistan in their previous game. Jordan hit back though with Baha' Faisal completeing his hat trick with five minutes remaining but credit to Kuwait they hung on in there with Al Nassar equalising deep in injury time. Coach Wilhelmus Leushuis will take some consolation from his young side's determination and attitude in salvaging a point. The Dutchman had said ahead of the competition his squad had been badly depleted by injuries and players taking exams (!) but may well look back on the 0-0 draw against Kyrgyzstan as the game when their fate was decided. Still, four goals in his three games for Alazemi bodes well for the future and he may well be one to watch next season in the Kuwait Premier League...if I ever get to find out who he plays for ! In what has to be the least surprising news since two British people bumped into each other and started talking about the weather, Indonesia's pre season competition has been cancelled before it even began. I am at a loss to know why the powers that be at the Indonesia Super League even contemplated holding the event; the league was cancelled a few weeks ago because the government had withdrawn support of the PSSI and the police had stopped issuing necessary security permits for games to go ahead. But that didn't stop the ISL, in a total suspension of logic, going ahead of doing a draw for the competition and clubs restart training with players who have been in receipt of various levels of payment since the league suspension. We are still in wait mode. FIFA has given a deadline of 29 May for the government and PSSI to get their stuff together or sanctions may follow. The government shows no sign of backing down even though some members of its transition team and withdrawn for whatever reason. The ISL are being optimistic if they think the league will even start again in September. The game, like it or not, is no longer in their hands. I would like to take this opportunity to protest most vehemently about Turkmenistan. Their decision to withdraw from the AFC Asian Championship Under 23 Qualifiers in United Arab Emirates meant the schedule was changed and now instead of me catching a game this weekend the other squads will be back home catching up on Game of Thrones. So the qualifiers end tomorrow with a crucial decider between Jordan and Kuwait to decide who finishes top and reaches the finals in Qatar next January. The runner up can also make the cut if they are one of the best second placed teams. There is still one spot left for the best runner up and Uzbekistan will be hoping Jordan win the final game as their spot is in jeopardy. My latest piece for Four Four Two Malaysia looks at Pahangs next opponents in the AFC Cup. It is disappointing that a pulsating cup tie that ticked all the right boxes for local football should be remembered for the violence that followed. Terengganu were leading 3-2 in their Malaysia FA Cup semi final second leg tie against LionsXII when a goal was disallowed for offside in the final minute. Credit to the match officials for having the balls to do that though of course officials from the Malaysian side were less happy and want the decision investigated. Had the goal stood then it would have been Terengganu who would have been heading to KL for this weekends final against Kelantan but as it was the Singaporeans are now planning a weekend away. Following the game an element of the home support went on the rampage, smashing up parts of the stadium and attacking coaches carrying away supporters home. The fact that two players saw red in the wake of the decision to disallow the goal may or may not have made matters worse; if they had just carried on with the game perhaps that may have eased the tension but we are talking about an FA Cup semi final. We are talking the last minute. You want drama, it had drama. And anyway isn't it time people took responsibility for their own actions and not just blame others? It is just a shame the post match scenes dominated the headlines for the game itself looked to be a cracker, well worth remembering for superbly taken goals from Khairul Amri (LionsXII) and Norshahrul (Terengganu). At a time when a Malaysian fan group is calling for supporters to boycott high profile but ultimately meaningless friendlies against overpaid, unfit EPL stars these are headlines the local game just does not need. Officials are concerned a high profile anti hooliganism campaign is not working and there now calls for games to be played in empty stadiums if they are considered high risk. That would be a shame as it would essentially negate the good work some fan groups are doing to make the terraces a more lively place and perhaps there should be questions asked about security procedures in and around stadiums. But fans must play their part. There are winners and there are losers in football as there are in life. A goal disallowed in the final minute is part of the game...unfortunately when it happens in this part of the world there will always be suspicions and conspiracy theories given the history and reputation of match fixing. Setting fire to ambulances? Let's hope one of those responsible does not need emergency care himself anytime soon and there is no vehicle available. On a night when Malaysian football should have been the winner we are left with the ashes of a riot and broken glass to tell their own sorry tale. It h as certainly been an eventful 2015 so far for Fazrul Nawz. The Singapore international started the year looking forward to playing for Sabah in the Malaysia Premier League but unfortunately things did not work out for him there. Anyway he returned to Singapore and was picked up by reigning SLeague champions Warriors as they set about building a squad to challenge in the AFC Cup as well defend their title. While it has not been the best of campaigns for the Warriors, they are second but a poor defence has hampered their efforts to pull away from the pack, Fazrul has put the Malaysian episode behind him and continues to do what he does best; score goals. His six goals so far this season makes him the league's third highest scorer as well as the top scoring local striker. While he has tasted success with LionsXII in the Malaysian Super League (2013) and Singapore (ASEAN Cup 2007, 2012) Fazrul has struggled to make a name for himself in the way other Singaporeans have ike Noh Alam Shah, Indra Sahdan and Khairul Amri but his consitency surely deserves some recognition? And let us not forget how important he was for Gombak United, remember them, when they had surely built a team ready to mount a serious title bid before the government got involved and deported their foreign strikers. Later today first meets when second when leaders Albirex Niigata host Warriors. When they met earlier in the season the White Swans thrashed Warriors 6-0 at Woodlands Stadium. Warriors will be hoping to overturn that humiliation and looking to Fazrul to score the goals that send them back to the top of the table. So Ian Wright is currently in Singapore promoting the upcoming EPL spunkathon where Singaporeans are offered the opportunity to hand over heaps of catch to see unfit players from Arsenal, Everton and Stoke City strut their stuff. This benefits Singapore how? Well, it doesn't of course. People who whine about paying 5SGD in the local league will quite happily fork out 10 TIMES that just so they can tell their mates their saw Ozil jog up and down the touch line before making a cameo appearance. Singapore football is in a rotten enough state at the moment, it needs all the help it can get from the fan...god knows the administrators are not up to the task. Having the likes of Arsenal in town will boost Arsenal's profile and allow me the chance to catch up with some mates who will be flying in for the game. But for the SLeague it will do jackshit. For Singapore football it will do jackshit. Last night Warriors ended their woeful AFC Cup campaign with a 2-0 loss at home to Maizya from that well known football powerhouse Maldives. Did Ian Wright go to the game? Was he aware of the game? Is he even aware they play football in Singapore? I tried asking on twitter whether the organisers had any plans to take hiim to watch a game while he was in town but I was of course ignored. No doubt if I asked what colour socks he likes to wear on match day I would have got an answer and been retweeted by Arsenal. The games come towards the end of the fasting month and at a time when traditionally players spend time with their families. That goes out of the window of course as the FAS happily agreed to everything the EPL circus demanded for the opportunity to fill the seats at the new stadium and have pictures taken with bored professional footballers. In Malaysia one fan group is calling for local fans to boycott games against Spurs and Liverpool claiming they do nothing for the game in Malaysia. #SayNoToCircusGames has been trending in social media for a while as fans protest at how the local league gets dicked around just 'cos a couple of English clubs deign to visit...on their terms. One of my gripes has been the insularity of football in Indonesia. Overseas is seen as Malaysia, a land with a shared heritage and culture. Very few players have gone abroad and made a real go of it. The small mind, small town mentality is stifling and it is choking the growth of football. Football needs new ideas and they are not coming from within the 17,000 islands where the latest mess is an example of people using the game for their own means. No one has a bigger picture because their horizons are so limited. Players like Arthur Irawan are the exception. He got out at a young age and is now playing professionally in Belgium. Of course that does not necessarily translate into recognition in his homeland as he struggles to impress the national team selectors. Now we have Rudy Eka Priyambada. Rudy took over at Mitra Kukar when Scottt Cooper stepped down but when the ISL was stopped he was left without a job. Rather than sit at home and wait for the local media could contact him for stories such as 'Coach Disappointed League Has Stopped' Rudy looked elsewhere. His perserverance has paid off as he has landed a coaching gig in Bahrain with Al Najma. Let's hope the post works for him and he sets an example other coaches follow. And it gives me an excuse to pop down to Bahrain for a natter and perhaps search out some rendang! The Indonesia Super League have announced the 2015/2016 will kick off in September. The 2015/2016 season replaces the 2015 which was cancelled after the government refused to recognise the football association and the security forces refused to release certificates to allow games to go ahead. The league have also announced a pre season tournament will begin at the end of May. It is not clear whether this competition will be called the Inter Island Cup, they havent finished last year's yet, the Indonesian Cup or the We Do Live In Lah Lah Land Cup. The competition is due to start two days before the FIFA imposed deadline for football to get its house in order or face another strongly worded letter...even sanctions. As for the small matter of security forces giving their permission for games to go ahead, you know that thing that caused the 2015 season to be halted, the ISL say they will apply in the normal way. Meanwhile the government team set up to oversee something in footbal has seen a couple of people leave. It looks like they have not been replaced. or have they? Well, how about that then? The clubs from Indonesia, Kuwait and Malaysia make it through to the next stage of the AFC Cup while the Singapore clubs left licking their wounds, both finishing bottom of their respective groups. So it is Al Kuwait who are crowned Kuwait Premier League champions for the second time in three years in what was a nail biting affair at the Kuwait Sports Centre. Although they went into the game level on points with rivals Al Arabi they had a far superior goal difference but Al Arabi were up against Al Tadhoman, the side with the weakest defence in the league. Despite going 1-0 against Al Sulaibhikat on 16 minutes through Khaled Ajab the news from Al Arabi was not good. The goals were rattling in and that eight goal difference was being whittled away. With minutes to go Al Kuwait's superior goal difference had been whittled down to just two and with many of the teams in the lower reaches of the league low on fitness levels there was always a liklihood Al Arabi could keep scoring. Fortunately for Al Kuwait Shadi Hamami soothed their nerves with a second goal on 89 minutes and this time there was not enough time for Al Arabi. The dropped points at home to Al Qadsia last week were to prove costly and they could not summon up any more goals in their bid to end their title drought. The season isn't over yet for Al Kuwait. Next week they travel to Bahrain to take on Al Riffa in the AFC Cup in their final group stage tie. Remember how excited you (probably) were when Manchester City won the EPL in the last minute against QPR a couple of years back? And all the accompanying hype and hullabaloo? Well the final day of the Kuwait Premier League is probably a bit like that. But without the hype and hullabaloo. Two teams go in to today's games with a chance of winning the league. The numerically alert among you will see that Al Kuwait have the goal difference to secure the title should both teams wins but Al Arabi are playing Al Tadhamon, bottom of the table and conceded 80 goals in their 25 games including 33 in their last six games. Al Kuwait though have been relentless. 10 straight wins has seen them close the gap on Al Arabi and now they will go into the last game of the season against Al Sulaibhikat knowing that if they win 3-0 Al Arabi must win 11-0 to be crowned champions. Historically Al Arabi are top bunnies in Kuwait but the last of their 16 titles came way back in 2001/2002 when there were only eight teams competing. Since then Al Kuwait (4 times) and Al Qadisa (8) have shared the trophy between themselves. Al Arabi were held 0-0 at home by Al Qadsia last time out, a result that does seem to have ended their dreams of breaking their 13 year drought. Al Kuwait showed championship form however by coming from 2-0 down to win 4-2 against Yarmouk. Today promises to be a thrilling climax to the season, a climax that promises goals! Diet - eating bakso and drinking teh botol does not professional athletes make. Samba - I have been watching Indonesian football for the best part of a decade now and not once do I recall seeing a passage of playing that had me going 'ole'. Players - Brazil had Pele, Romario, Garrincha, Tostao, Ronaldo. Indonesia have had players like Bambang Pamungkas, Pnaryo Astaman, Budi Sudarsono, Hamkah Hamza. Brazil has a new generation including the likes of Neymar. Indonesia is hoping Evan Dimas will be the saviour. Awareness - good players know what to do with the ball before they receive it. Watch an Indonesian game and tell me that is so. Coaches - rumours are rife players are asked to give the coach a bit of cash to get in the first team. Insularity - Brazilians have been going overseas for years. You can probably count the number of Indonesians on two hands. Those that do go often making a beeline to Malaysia, similar language and culture, and still can't wait to get back. Big Fish Syndrome - a player from a poor family in a poor village earning an above national salary at a provincial club (if he gets paid at all) will be seen as a success by all. No need to develop or move. Professionalism - cutting corners is a culture. Queuing is for airports and tourists. Tactics - all those coaches go on all those courses...watch an average game and try and work out a game plan! Clubs - in Indonesia have no structure, no entity beyond living season to season on hand outs. There is no concept of a club beyond the 90 minutes on match day. Officials are often short term appointees. Coaches come and go at the whim of the officials. Players are journeymen in every sense of the word. And most clubs have no infrastructure in place to ensure smooth administration, youth development, stadium maintenance etc etc. Success - Brazil has a record of success going back decades. Success breeds success. Indonesia has a record of failure going back decades. Failure breeds failure. Potential? - There is no potential when too many coaches can't coach, too many players can't pass or control the ball and too many officials can't see beyond the end of the week. There is a wonderfully insane look to the SLeague this season. Foreign teams make up two of the top three, the league leaders have the worst defence in the league and the sides competing in the AFC Cup have played more league games than their domestic rivals. Maybe it is all part of the Football Association of Singapore's cunning strategic plan? Warriors, last years champions, are top again but they have conceded 18 goals...more than any other side in the league. They have also scored more than any other team but there can't be many leagues around the world where the leaders have a zero goal difference. Like Warriors, Balestier Khalsa are playing in the AFC Cup this season. Their reward for representing Singapore football is have have played nine games in the SLeague...only Warriors (10) and Albirex Niigata (10) have played more. Is that how the SLeague recognises success? By punishing its best teams? We are used to seeing the top scorers in the SLeague have non Singaporean passports and that is also the case this season. 15 players have scored three or more goals so far this season...only one can represent the national side; Fazrul Nawaz (6 goals for Warriors). Little wonder so many are rushing to pen obituaries but I have complete faith in the FAS and their renowned marketing department. I remain convinced this is all part of a cunning plan and oh how we shall mock the doubters when everything comes to fruition and a Singapore Select score a goal against Arsenal in a friendly...for surely that is the aim? And as for the Young Lions? In this season, when they will no doubt be at the heart of Singapore's bid for regional supremacy in the SEA Games, they are botttom of the SLeague with one win and four goals so far this season. But they do have a better defence than the Warriors! Mind you, so did Nigel Clegg. Did you see what I did there? I injected a little bit of Lib/Dem gallows humour into a piece about the SLeague...I'll get my coat! One last thing...good to see the super club formed from the merger of Woodlands Wellington and Hougang United, cunningly rebranded at Hougang United, are winless after nine games. That plan worked well, didn't it?! Ok so the youth and sports minister, continuing to save Indonesia football, has announced his committee that will look at, um, football I guess. If you have been backpacking around the asteroid belt in recent weeks the government has decided it doesn't like the people who run football and so no longer recognise them. The people who run football say we don't care, FIFA love us. The government said we don't care about FIFA this is Indonesia and asked security officials around the country not to allow games under the PSSI to take place. The PSSI responded by saying if you won't let us play football we will take our ball and go home so they stopped the league. Now the government has come up with a list of people who will do something. What, I'm not sure. Change the game perhaps? Run the league? Send FIFA a letter? Anyway these are the people, and their jobs, who could well have a say on the future of football in Indonesia. The World Cup Qualifying Rounds begin this year for Asian sides and Malaysia is no exception. They certainly have been drawn in a tough group with home and away ties looming against Saudi Arabia, United Arab Emirates, Palestine and Timor Leste. Given the high expectations in Malaysian football you would expect the FA to be focussed on seeing their team reach their first ever finals wouldn't you? Certainly ties against the Saudi and UAE won't be easy. But instead of lining up quality opposition the FA have ditched a proposed friendly against Philippines and decided to focus instead on meaningless friendlies against an uninterested, unfit bunch of Premier League players! Laughable isn't it? Who needs the World Cup when you have the opportunity to rub shoulders with people from two faded EPL powers, Liverpool and Tottenham? And it won't even be the Malaysian national team that plays them...it will be one of them god awful selections which are all things to no one in particular except egotistical club owners whose idea of football is photo shoots with famous players. There is absolutely no benefit in Malaysia playing these two opponents. No benefit for the national team and no benefit for the national game. Instead a whole bunch of money will be spunked on the EPL prima donnas to allow them to travel first class and sleep five star while fans pay through the nose for the privilege to scream and swoon on cue. The job of the Football Association of Malaysia is to develop football, not pander to the egos of its officials. Fans are calling for the games to be boycotted, #SayNoToCircusGames, and they are right to do so. Playing a bunch of unfit, uninterested jet lagged professionals will not benefit the cause of Malaysian football one jot. Just when it seemed Al Arabi were cruising to the Kuwait Premier League title! It may have been an evening kick off but the crowds were building up early outside Al Arabi's stadium in the plush suburb of Mansouriya. In the early game Al Kuwait threw down a marker with a convincing 4-2 away win at Yarmouk; a result made all the more remarkable when you consider their unbeaten record this season was under threat as they went 2-0 down after 29 minutes. A scintillating second half performance saw Al Kuwait turn things around with three goals in 13 minutes after the breaking taking them back to the top of the table. A fourth by Abdulhadi Khamis with 11 minutes on the clock was the icing on the cake. With the ground packed to the rafters Al Arabi knew what they had to do. A win over Al Qadsia would return them to the top of the table with a two point advantage going into their final game against hapless Al Todhamon on Saturday; the title would surely be theirs. But Al Qadsia weren't in the mood to let their AFC Cup exertions provide an excuse for a poor performance in the league. They held out for a 0-0 draw and in the process ensured the title race will go down to the wire this weekend. Goal difference favours Al Kuwait but Al Arabi are up against a side that have conceded 80 goals in 25 games. Al Sulaibhikat's defence is a much meaner affair, shipping 32 all season. Saturday promises to be a thrilling day in Kuwaiti football with more than a few goals thrown in for good measure. But who will triumph? So yesterday I attended my second game in the Kuwait Premier League. Al Salmiya (pictured sky blue) hosted Al Falaheel in a game played out in front of perhaps 70 fans! Al Fahaheel haven't had the best of seasons and find themselves third from bottom ahead of this game while Al Salmiyah have the equal best attack in the league. The first 45 minutes you would have been hard pushed to tell which was which; Al Salmiyah had the quality but there was a determination about the visitors that kept them in the game. Second half was a different story as Al Salmiyah hit five without reply and it could have been many more. We shouldn't have been surprised I guess. Al Fahaheel in recent weeks have lost heavily against Al Kuwait (8-0), Al Arabi (5-0) and Kazma (4-1). They have conceded 66 goals in their 25 games, scoring 23. Their last win came against Al Tadhamon when they won 5-1! If you think Al Fahaheel sound bad then have a look at Al Tadhamon. They have two wins all season with the last one being in December! Since then they have gone 13 straight defeats! They have conceded 80 goals in their 25 games and yesterday they lost 6-1 against Al Sahel. And that was Al Sahel's first win since the end of November! While Al Kuwait and Al Qadsia battle it out in the AFC Cup and while Al Arabi appear to be in cruise control in the race for the Kuwait Premier League the likes of Al Tadhamon, Al Sahel and Al Fahaheel seem to be miles away in terms of quality. And I am not sure if there is relegation or not! Al Arabi have two games left to play with the last one at home ... to Al Tadhamon! Football is odd. Not what happens on the pitch or the lengths fans go to following their team. For me as a fan I find it odd that for many people football is just a job. One where they go to work, tick a few boxes, shift a bit of paper from one tray to another and moan because the person opposite spends too long on Facebook. Odd because there is such a massive disconnect between one person's passion and another's for an early coffee break. This last week has seen the great and the good of the Asian Football Confederation converge on Bahrain. For me these events seem to be no more than a back slapping extravaganza where a load of men tell each other how wonderfully they have done as their fingers grasp ever tighter round the handle of the blade. It is interesting how the top jobs in the organisation have been doled out. We have important positions going to people from Laos, Malaysia, Singapore, Timor Leste, Malaysia and Philippines but not Myanmar, Vietnam and Indonesia. Singapore? Yeap that league where discussions have apparently been held to fold the SLeague. Guess that won't happen though will it...can't really go on all those junkets if you are not representing a league! And then Indonesia. We really can't expect Indonesia to have a representative at the top table of regional football when they can't even organise a domestic league. Singapore can organise a league, they can't sell it. Indonesia cant organise it even though they finally managed to get a decent sponsor for the first time ever. Of course Indonesia has long be unrepresented in the corridors of power. Check out the ASEAN Football Federation where a guy from Singapore is on the marketing committee (don't laugh). Just Joko Driyono. To be fair there was one guy, who had spent time in jail, who seriously wanted to put his name forward for one of the real top jobs at ASEAN...never happened of course! You get the impression FIFA wants to keep Indonesian football as far away as possible. Witness their lack of activity during the numerous crisis in recent years. They are kept busy enough dealing with irate players demanding their contracts are honoured without having to get their heads around two leagues, two associations, two national teams, two players unions and sod all bloody development. Perhaps out of sympathy they have appointed some refs to their international list. Despite the government 'disbanding' the PSSI the newly elected chairman was there in Bahrain pressing the flesh and having access to the movers and shakers. While other member associations in ASEAN recognise the importance of rubbing shoulders with people of influence in Indonesia that world view is sadly lacking. Regional petty potentates are delighted to have their own fiefdoms with which to impress the locals, Looking beyond provincial borders is not considered a prerequisite and as for all that foreign stuff? Oh no, don't need none of that. And there we have it. It matters not one jot who wins the latest spat between the government and the PSSI as there is no party involved that has any kind of vision to take football forward. Because for them football is just a vehicle, one of several they attach themselves to in a personal convoy designed to make them look big and powerful. The beautiful game is smashed on their egos and we all suffer.